The Community Engagement Core (CEC) engaged 27 Tribal members in three 90-minute focus group sessions to elicit feedback about tribal indicators of health, environmental health concerns, and the importance of smoked food as a cultural tradition. The findings were published in Environmental Justice. Schure M, Kile ML, Harding AK, Harper B, Harris S, Uesugi S, Goins T. Perceptions of environment and health among community members of the Confederated Tribes of the Umatilla Indian Reservation. Environmental Justice. June 2013, 6(3): 115-120. doi:10.1089/env.2013.0022. The CEC was also featured in the NIEHS publication, Celebrating 25 Years of the Superfund Research Program for research on PAH exposures during traditional smoking of salmon with the CTUIR research. You can also view the Please view the 2011 report for more information. 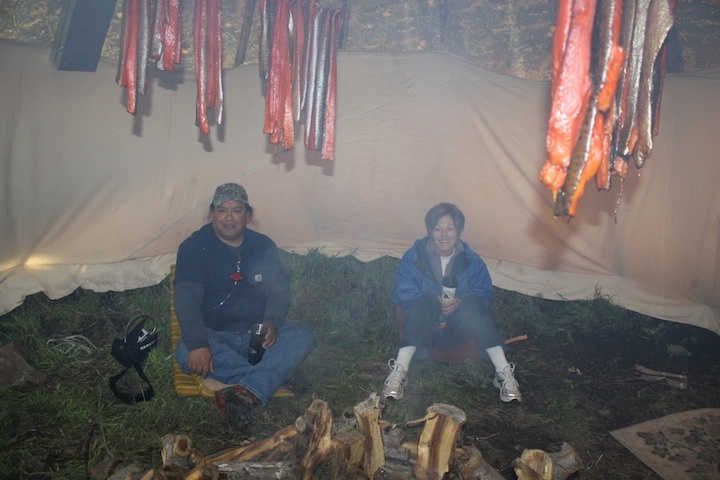 Mr. Stuart Harris and Dr. Anna Harding sit in the tipi that is measuring the air quality when smoking salmon. Posted in Publications, Research, Training.